The popular and easy digestible operas are what brings many of today's audiences into a theater to see opera. Like the other classics, such as ballet and classical orchestral performances, opera is, unfortunately, a struggling art. So, Florida Grand Opera was wise to stick with a guaranteed crowd pleaser for its 75th anniversary season opener. And, it packed them in for a Sunday matinee at the Adrienne Arsht Center. 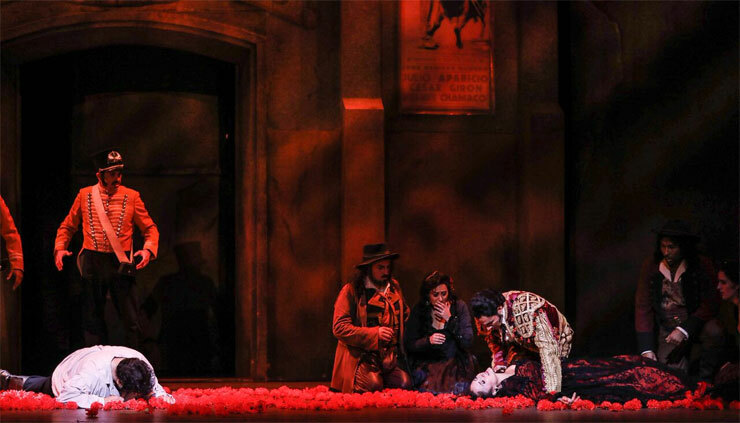 Bizet's "Carmen" is one of the most performed operas in the operatic canon, the story of a seductive and tempestuous gypsy, who basically ruins the life of a lovestruck soldier who goes AWOL to be with her to catastrophic results. 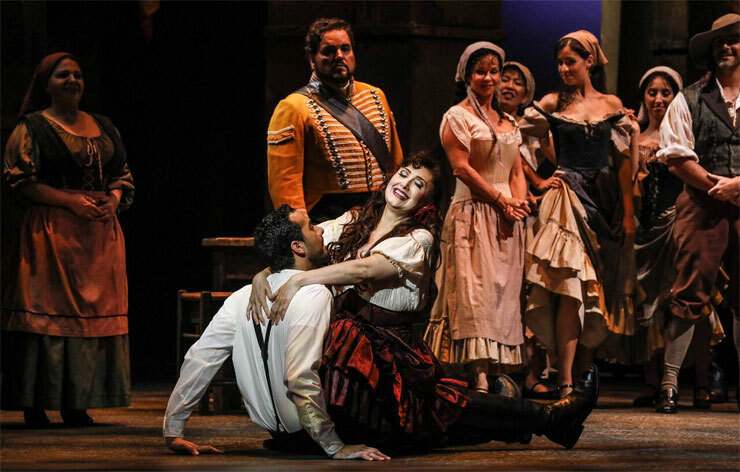 This is the opera that features the song "Habanera," which has become a pop cultural icon. 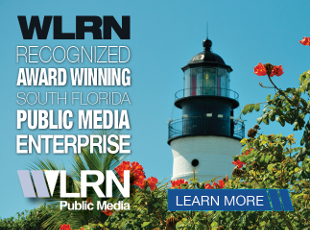 (Listen to audio here.) It is literally a Havanan dance, which originated in Cuba, and influenced Bizet for the spicy song. The Spanish influence is also heard in his Toreador Song. Then there are the beautiful tributes to Flamenco instilled in sequences. 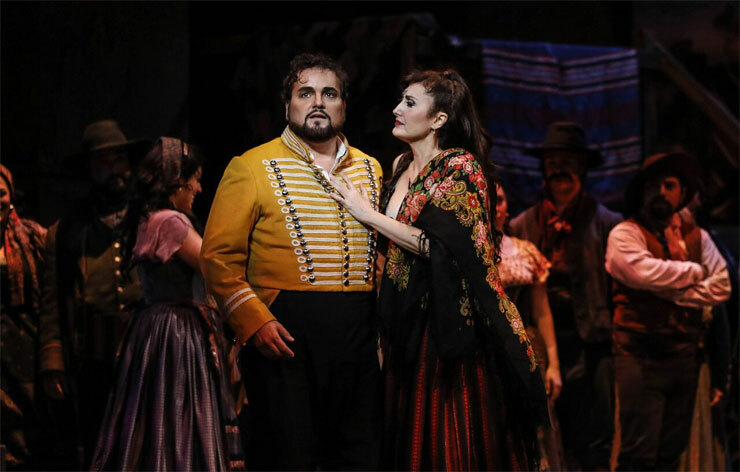 The opera is all the more fetching since it is written in French, yet has this infusion of colorful Spain in its plot and influences. Florida Grand Opera and director Bernard Uzan embraced all of this about the piece and more. 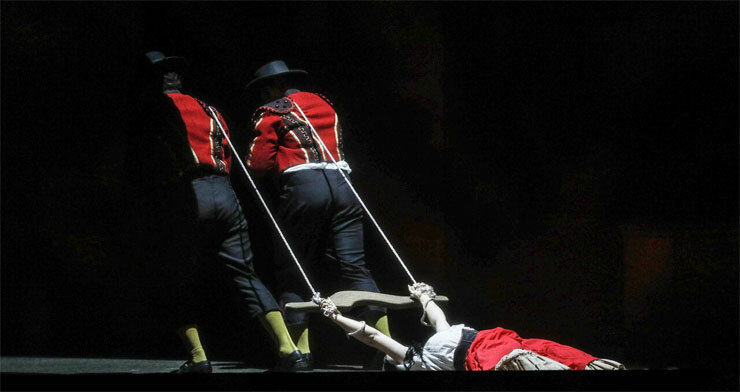 "Carmen" is also one of the best-known examples of opéra-comique, a genre of French opera not necessarily comic despite the name, but featuring spoken dialogue, not the norm for traditional opera. Uzan based FGO's production on the original opéra-comique version with spoken dialogue, rather than the sung recitatives inserted after Bizet’s death; the usual standard. This original approach gives more depth to the story and creates another level of characterization. 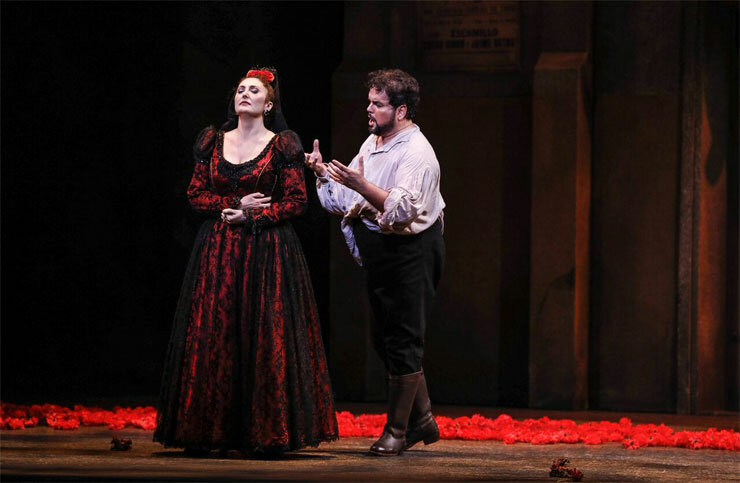 Despite the delivery in French when sung to an English speaking audience, the dialogue still adds to layers of the multi-leveled "Carmen." 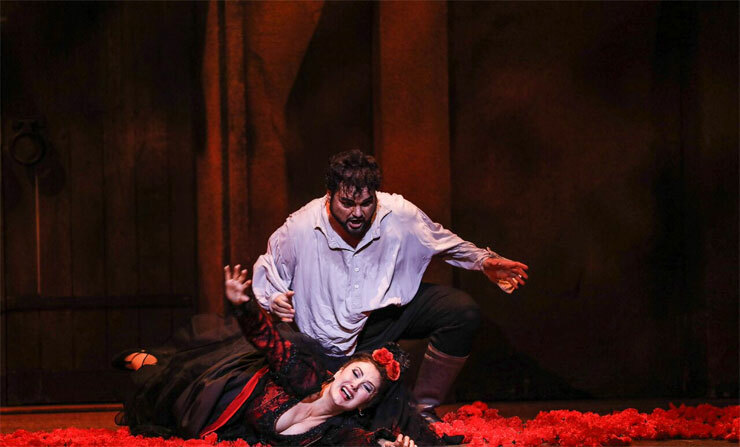 This production is beautifully colorful soaked in Sevillian red. From the moment the FGO orchestra, under the direction of Ramon Tebar, begins to play Bizet's lush score and then as the deep, red curtain rises, the next three hours are like soaking in a tub filled with rose petals. This "Carmen" is smooth, albeit sometimes too smooth, since the only thing lacking is a more fire in its sexiness. 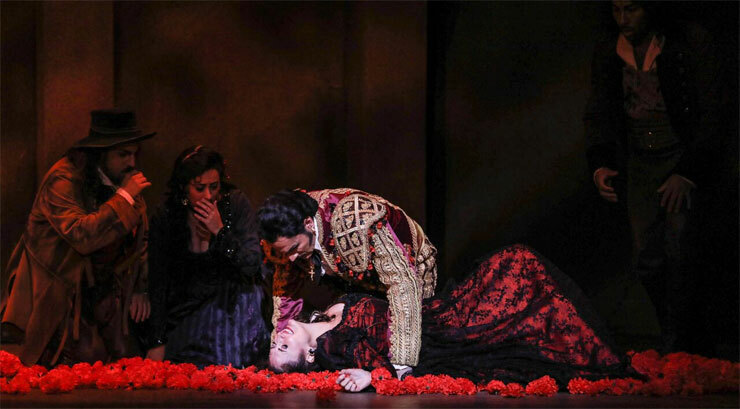 There's built-in smolder in "Carmen" and it's what's made the role a tour de force for any singer – how a temptress takes men under her spell, the woman who sparks catfights amongst cigarette factory workers and knife duels between soldiers and bullfighters. There's the gusto of flamenco dancers and the pomp of the bullfighters on parade. How fantastic to see the fine, fine flamenco on stage here and those in the audience familiar with the dance applauded the dexterity and precision of the flamenco dancers each time they finished an interlude. 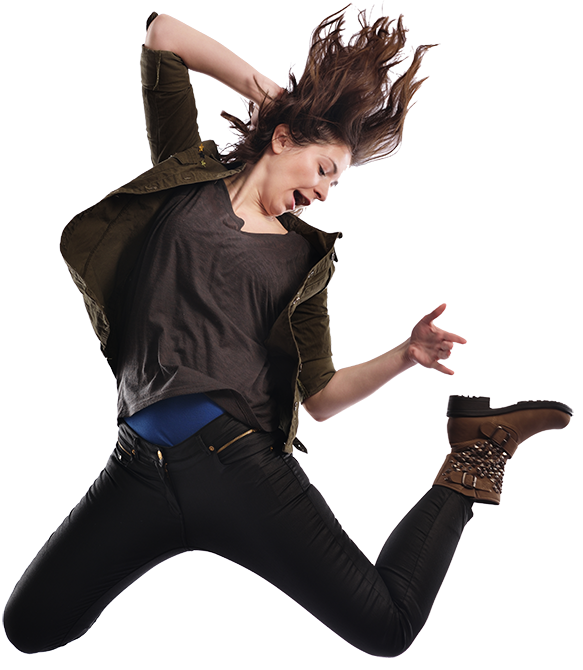 The lively choreography of Rosa Mercedes featured Betzy Belen Almaguer, Liliana Fagoaga, Edwin Suarez and Carolina Torres pulling out all the stops and stomps. 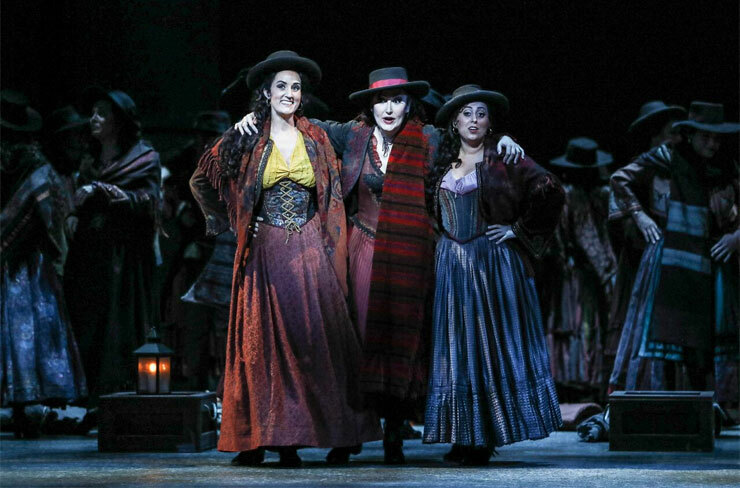 Tara Venditti's Carmen (who performed the role on Sunday, Nov. 13 and will again on Nov. 18; Maria Jose Montiel is in the lead role Nov. 12, 15, 19, Dec. 1 and 3) was sly and wicked, portraying her gypsy as an almost sexual spell weaver. Her mezzo soprano was strong and rich and adds to the foundation of her "don't 'f' with me, fella" believability. Alok Kumar as the naïve and hapless soldier was convincing as he struggled between his love for country and his lust (or so he thinks is love) for Carmen. 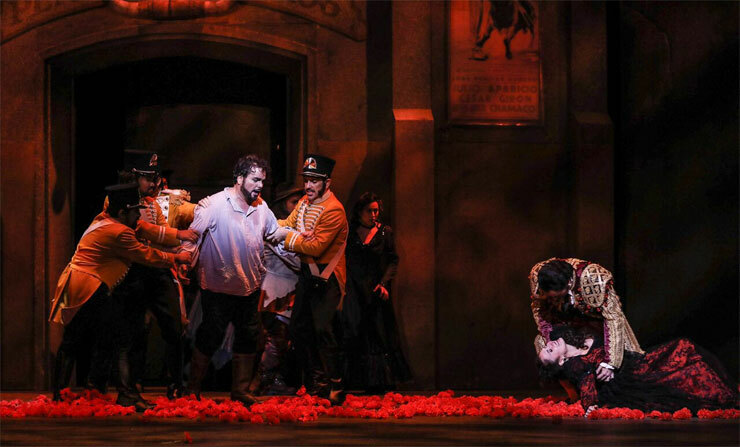 Kumar's tenor had an aching tone as Don José began his obsessive descent. With technical vocal precision and nuance he turned his tough soldier into a weeping man-child who refuses to accept Carmen's rejection. The difficult aria “La fleur que tu m’avais jetée” was sung with so much emotion there was silence before rousing applause. Bass-baritone Calvin Griffin ably stepped into the role of Escamillo, replacing the under-the-weather Ryan Kuster for the Sunday afternoon performance. Griffin is making his debut with FGO this season. The announcement proclaimed that audiences weren't supposed to see Griffin until he debuted with the opera in the upcoming "Eugene Onegin," but here he was. As the dashing toreador, Griffin was fetchingly convincing. Soprano Hailey Clark as Michaela struck a contrast to Venditti's bold Carmen. She captivated the audience in the beautiful aria “Je dis que rien ne m’épouvante,” effortlessly soaring in the aria’s highest ranges for an absolutely gorgeous interpretation. 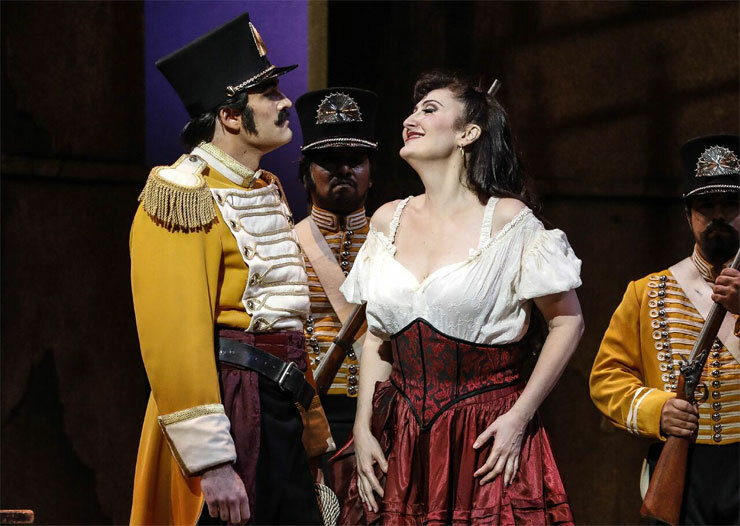 There could have been more sensual sparks between Carmen and her soldier, especially in their sultry scene where Carmen tantalizes the spellbound soldier. And the fire in the belly all around sparked, yet never took on what could have been blazing proportions, but the musicality presented in this "Carmen" was so beautifully rendered that settling for smoldering rather than a full-on wildfire was more than satisfying. 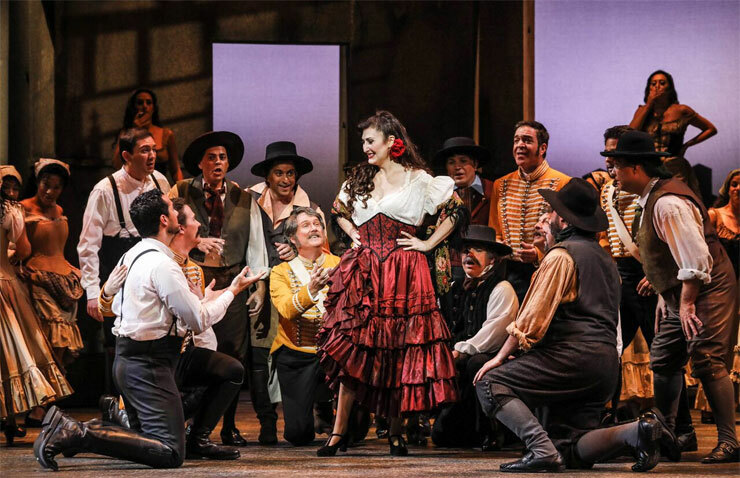 Florida Grand Opera performs "Carmen" 8 p.m. Tuesday, Friday and Saturday at the Arsht Center’s Ziff Ballet Opera House, 1300 Biscayne Blvd., Miami. 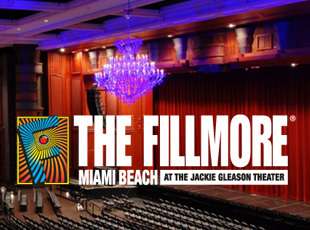 Tickets $12-$175; Also 7:30 p.m. Dec. 1 to 3 at Broward Center For The Performing Arts, 201 SW 5th Ave., Fort Lauderdale. Tickets $21-$200. 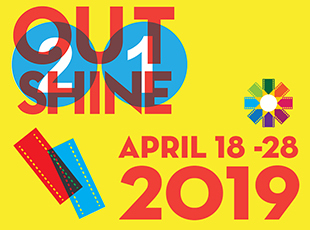 More information at fgo.org or call (800) 741-1010.